Hines, Archstone and the TFI US Real Estate Fund, sponsors of CityCenterDC, announced today the commencement of sales of luxury condominium residences at CityCenterDC, the 10-acre parcel in the heart of Downtown D.C. that is currently being transformed into a vibrant blend of residences, offices, shopping, restaurants, hotel and active parks. The new center for urban living is showcased in an expansive and interactive sales gallery – at 901 New York Avenue, NW – with an impressive scale model of the entire development, a fully built-out model residence and a striking view of the new neighborhood under construction and quickly taking shape. Designed by London-based, globally recognized architecture firm Foster + Partners, the 216 condominiums provide homes with open layouts where natural light and outdoor spaces combine seamlessly to create a unique residential experience. 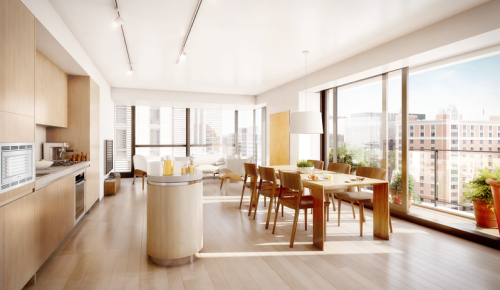 The one- and two-bedroom residences have access to balconies and outdoor spaces of up to 900 square feet, and feature signature hallmarks of Foster + Partners’ design, including light-filled modern interiors and natural-colored materials. Residences are crafted with high-quality, custom details and environmentally responsible materials that offer thoughtful living in a modern environment. There are a variety of options for combining multiple residences. Pricing for the condominiums ranges from $500,000 to $3.5 million. Construction is well underway with an anticipated delivery in Fall 2013. The residences will be complimented by more than 60 shops and restaurants, providing one-of-a-kind shopping and dining destinations for the Washington, D.C. metropolitan area. According to The Mayhood Company, exclusive marketing agent for CityCenterDC, pent-up demand to experience CityCenterDC’s residences led to the creation of a preview list with more than 1,200 names. The Mayhood Company is taking appointments for those on the list and will be available to schedule additional appointments in the first quarter of 2013. Prior to the opening of the sales gallery, the primary point of contact has been the website www.citycenterdc.com/condominiums. Open living rooms feature floor-to-ceiling windows that draw on different exposures to maximize natural light, while Foster + Partners’ signature solar shades on the building façade provide light control. Northern European white oak flooring further enhances the open, natural feel of the space. All of the homes provide the ability for residents to extend their living quarters through outdoor spaces. Amenities at the premier residences include a concierge; 24-hour security; fitness center; yoga studio; bar lounge; two expansive roof parks, as well as a tranquil rooftop water feature; outdoor kitchens and dining room; fire pit; wine storage; indoor dining room; catering kitchen; executive board room; guest suite; landscaped terrace; and a spa treatment room. The residences will also provide their own exclusive property management team, which will coordinate with personnel servicing other aspects of the development.